BioSchwartz claims to have designed a potent formula that helps to promote rapid weight loss, rid your body of any toxins, reduce bloating and boost energy levels with its colon cleansing formulation. The product works over a period of 15 days by working to eliminate any waste build-up without any side effects. 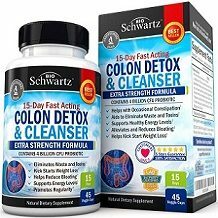 In this review of BioSchwartz Colon Detox and Cleanser, we are going to analyze all the facts to help you make an informed decision before deciding to purchase this product. Senna Leaves and Psyllium Husks are commonly known as a natural laxative that can help to clear up any waste build up. Flaxseeds are high in fiber as well as omega-3 fatty acids and contain anti-inflammatory properties. Cascara Sagrada and Buckthorn Bark help to promote a healthy liver and also acts as a natural laxative. Rhubarb is known to for aiding digestive conditions such as constipation, diarrhea, heartburn, stomach pain, and gastrointestinal bleeding. Glucomannan Root is known to promote weight loss by balancing cholesterol and blood sugar levels. This formula also contains Lactobacillus Acidophilus and Bifidobacterium which are commonly known as probiotics to help regenerate and restore healthy bacteria in the gut. Unfortunately, BioSchwartz has not mentioned on the product packaging what the dosage is and when to take it. The ingredients above are based on a serving size of 1 capsule. BioSchwartz has not mentioned if there are any possibilities of side effects but since this product contains a variety of laxative ingredients, diarrhea is to be expected. You should always consult your doctor first before if you have any allergies or have any known medical conditions. This product is not suitable for women who are pregnant or lactating. 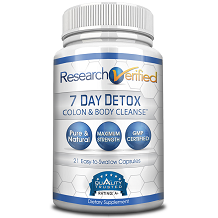 Each bottle of Colon Detox and Cleanser contains 45 capsules and retails for $16.95 online. This product can be purchased directly from the manufacturer. We were unable to find any discounts available for this product. BioSchwartz offers a satisfaction guarantee that covers you for 30 days from the date of purchase. You need contact the customer support center first in order to get approval for the refund. We like that this product is covered by a satisfaction guarantee and that it contains no allergens or additional fillers and binders. With that being said, we still have some concerns. Most of the ingredients in this product have a laxative effect and it may not be very safe to use over a 15 day period without taking extra care to keep yourself hydrated. It is also concerning to see that there is limited information about the recommended dosage. We were also disappointed to find many negative reviews that had complaints about stomach cramps and that the product was ineffective for helping consumers to lose any weight.